as part of this weeks remix project, i choose the assignment “tv show gifs,” making 4-6 gifs of my favorite tv show. which upon getting remixed turned into making gifs of my least favorite show. i decided to gif the tv series pretty little liars, which is not a show i hate — because i cant say i have ever even seen like five minutes of the show– however, it is a plot line that eternally irks. beyond the contextual background of the storyline, which i don’t have any foundational knowledge of… the fact that a show about stocker/killer/black-mailer, was able to go on for seven year. like, come on, after the third episode someone had to go to the police, right? i made these gifs from four different clips i found on youtube of the show, searching things like, “trailer,” “crazy episode,” and “intro.” i used mac screenshot to get the images and photoshop to make them to gifs. for this week, i unfortunately only completed 10 starts worth of assignments, but they were both about my character. the first was about creating propaganda set in the world of my character. next i did a characterization video, strictly from the prospective of my character, which was really fun creating. my three daily create can be found bellow. and lastly my commenting on the work of my classmates. thats funny, i like this combination! above is my video response to the video assignment “tell your character’s story.” i went about this story boarding by thinking about the transient nature of my character mo, and how she is everywhere (as a time-traveling badass) but also a centralized character (as i tell her story from a very specific characterization and perspective). i chose to do a list, and as opposed to typical characterization lists, this one is by mo herself. i used my iphone to record my audio, i used gargeband to edit the audio, and i used imovie to bring together the images and audio. i made all but one of the images on canva. i also have background music going on which is a looping segment i made of the track whipped cream by ari lenox, which adds a jazz/blues soundtrack to mo’s experiences, which translate to me as experiences of resilience and maturity. what ive learned about storytelling from making this video is that, while articles or videos titled top 10… can often be limiting in creating nuanced understanding of someone, they also for an opportunity to universalize characters which can be useful in videos like mine wherein i am just creating an introduction of the character for folks. above is my video creation for the video assignment “fake propaganda video.” i had several intentions when making this video, i wanted to create irony, suspense, and realism. while the concept of burning/banning or in any other way limiting access to books is not a new concept (i even refer to the book- turned movie, fahrenheit 451), my twist on this idea was to make the limitation of access to books seem like a cheery and lucrative endeavor. i also was making this video in association with my character, meskeen aka mo, in mind. given that mo acts as an empath whose life mission is to be of service to people and their personal liberation, the lack of access to books makes that pursuit even more difficult. i also gave another shout out to my character mo when i had the image that read “BOUNTY $100,000: WANTED: ALL REVOLUTIONARY REBEL ROUSERS,” because she is that rebel rouser that the dictators and oligarchs want captured. in therms of the “dud” democratic union of dictators, its an ironic title and a triple entendre. first, “dud,” as a word is slang for dumby. the fact that the words “democratic” and “union” are in the same phrase as the word “dictator,” speak to how the rulers use language (powerful language) arbitrarily to advance their position. and lastly, the fact that these dictators have come together so as to help enforce greater oversight, speaks to how power is a source that feeds on everything and everyone. i end with an assessment on the actual content i used and created. i used my iphone to record my audio, i used gargeband to edit the audio, and i used imovie to bring together the images and audio. i made all but one of the images on canva. and the image i used was a screenshot from the movie fahrenheit 451 by way of a blog called mattmulcahey. in terms of sounds, i used my voice as a tool and i used a clip of paper crumpling as the credits rolled. if i were to do this again i would make the images go slower, to adequately let folks read the writing on the screen. 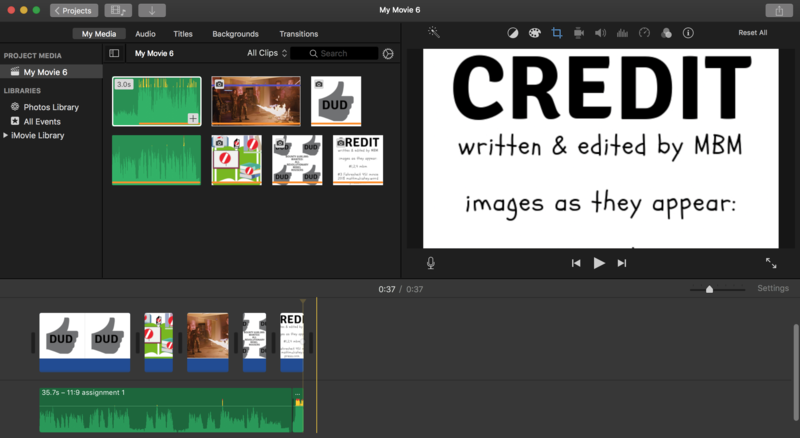 in making this video i learned that i could use canva to make the credits, which was wonderful to find out as i am more familiar with using canva for text manipulation, and in contrast, i have had a hard time in the past using imovie for making text on the screen. this video week was very interesting. my appreciation and admiration for video has definitely grown! 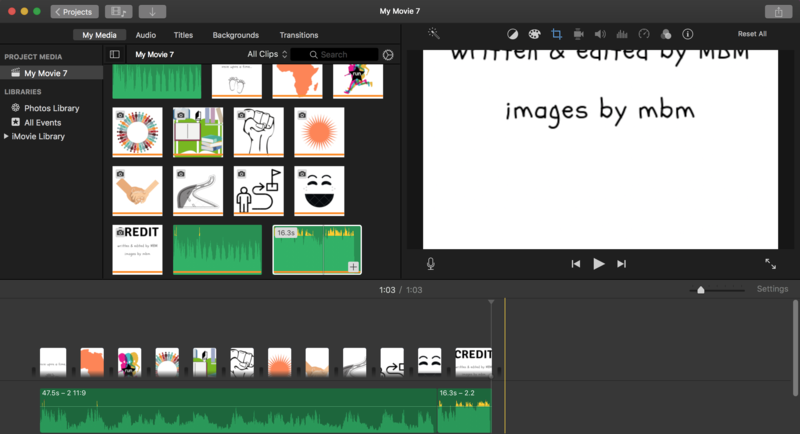 while i do have experience working with the tools that i used this week, such as imovie and garageband, the sheer about of time and patience it takes to create content you are satisfied with is definitely a practice of patience i had forgotten about. bellow you will find my video essay on the grinch, which did after reviewing how to do a movie critique. #tdc2487 #ds106 can you tell that these books are just for decoration? and bellow you can find my commenting on my classmate’s work. that is such beautiful artwork! while thinking about what event, and event photos/videos, to use for a b-roll reel, it occurred to me that i had on consciously made one a couple of days ago. this past fall break some students and i, along with the UMW Multicultural Center, went on a social justice trip to Alabama this past fall break. and a couple of days ago i made a video with some pictures from the event and background music. i had not shared this video with the public and since i made it a couple of days ago, and it fits under the “b-roll” assignment, i am submitting it as my project. 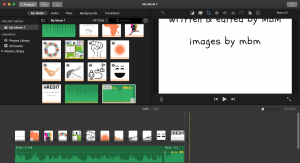 i used imovie and garageband to edit the music and audio used in the video. in this video i identified five of my favorite spots at the University of Mary Washington. in choosing my favorite spots, i just thought about the places i most frequent, and ta-da, the video came together. i used my iphone to record my voice over; i used google to find images of the different locations; and lastly i used imovie to put the audio and visuals together. i chose to do my video essay on the grinch because i find the movie to be very endearing in it message, and i thought it fitting for this project because of the ways in which the character dynamics are captured on screen. i wanted to focus in particular on the use of character positioning on the screen so as to explore power dynamics and how the grinch is shamed. i used a youtube video downloader to get the movie clip; i used my iphone to record my commentary; and finally i used imovie and garageband to edit the sounds and compile the video. for the video assignment “public service announcement,” i decided to dedicate the video to a topic close to my heart and home. shoes, slides to be exact, are a lovely take on the iconic sandal look. but unlike sandal, slides are an product made to be worn in the house, so as to distinguish between shoes that folks wear outside (in the rough and often dirty world) and inside (wear clean-clean-clean is the word). i made this cheeky psa by first recording the voiceover on my iphone and then using garage band to edit it and add background music and sound effects. 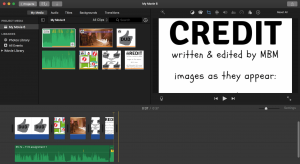 i then incorporated images from google (and i even used canva to create a image with a “do not enter” sign and a backdrop of slides) to a video i created on imovie. as part of the video assignment “create an intro to a movie,” i decided to make a 90’s themed movie intro that uses video clips from the music vide Friendzone by the artist UMI. i am not at all familiar with the artist or the song but i came across it as i was thinking of videos to select for this assignment. my initial thought was to use clips from 90’s black sitcoms like Martin, Living Single, and A Different World. however, the more i thought about it, i did not think a smooth and comprehendible story (or rather, beginning of a story) could be created by clipping together tv show intros. but as i was looking at the show intros on youtube, UMI’s video popped up as a suggestion. I was draw to its colorful thumb nail. i watched some of the video on mute, and without even hearing the song, i decided to use it for this project. next was writing the voiceover for the video. i decided to go with something that had a pop and rhythmic beat to it, and if you’re familiar with 90’s hip hop or 90’s pop culture in general, you’ll notice i have incorporated some lines that imitate other show/song lines. lastly, the editing, the most time-consuming component. i used my iphone to record the audio, youtube mp4 converter for the video and background music, garageband to edit the audio, and imovie to edit the video, and put the video and music together.